On highways around Connecticut and throughout the country, the roar of diesel engines can be heard. Whether a large diesel truck just finished up a cross-country delivery or a charter bus just filled up with seniors out on a daytrip, diesel engines play an immense role in America’s economic infrastructure. With higher demands placed on these diesel engines every year, employers in various industries need to expand their shipping fleets and hire on additional diesel mechanics. Individuals who wish to enter this industry will find that, with the proper education and training, they will have multiple career options at a variety of companies across America. Before a college will let individuals enroll in its diesel mechanic program, students first need to prove that they meet the school’s established educational prerequisites. Although the general requirements differ from place to place, all schools require one main prerequisite, which is for students to have earned their GED or high school diploma before starting classes. A select number of state universities and colleges hold applicants to higher standards, requiring future students to have completed four year of high school English and a minimum of two years of high school math and science. When interviewing candidates, most companies screen out those who have little experience and no formal training as diesel mechanics. Although limited, some companies that are experiencing a strong need for diesel mechanics will offer training courses at the employer’s expense for applicants. Most companies prefer potential hires to have earned a degree in diesel technology prior to applying for the position, and individuals who wish to enter this field should pursue their certification at an accredited college. After some careful research, individuals should have a handful of schools and diesel technology programs that interest them. Before enrolling, future students should verify that their desired schools are accredited by the National Automotive Technicians Education Foundation (NATEF), which is the preferred accreditation among employers. Once confirmed that the school is accredited by the NATEF, students who wish to become certified diesel mechanics can decide to pursue their associate or bachelor’s degree in diesel technology. Offering a balance between education and hands-on experience, the associate’s degree program in diesel technology provides students with the training they need to qualify for an entry-level diesel mechanic position. In this program, which takes anywhere between two and three years to complete, students will learn how to diagnose and repair common diesel engine problems. Taking place primarily in a lab or garage setting, students are able to practice the skills they learn while under the guidance of a certified instructor. 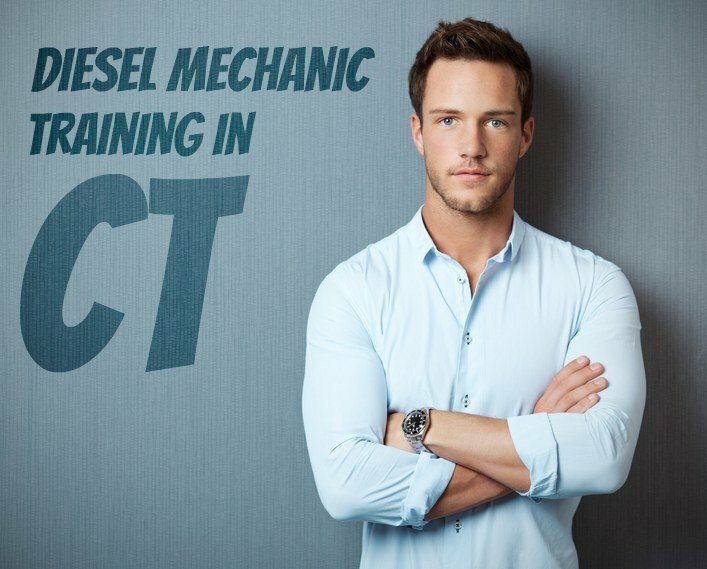 For those who hold higher aspirations of entering management or owning a mechanic shop during their career, the bachelor’s degree program in diesel technology provides students with the management and diesel engine skills they need to succeed. Taking up to five years to graduate, the bachelor’s program teaches students the methodologies and science behind effective diesel engine diagnosis. Future diesel mechanics also learn the complex workings of a diesel engine to prepare them for maintaining and servicing diesel engines in a real work environment. While companies prefer to hire applicants who have become certified in this field of expertise, the state of Connecticut does not require diesel mechanics to obtain licensure in order to legally work there. After a few years of experience, diesel mechanics can earn various certifications through the National Institute for Automotive Service Excellence (ASE), proving their proficiency in electrical systems, steering systems, preventative maintenance, and brakes. Based on a study, the U.S. Bureau of Labor Statistics (BLS) reports that businesses in Connecticut employ roughly 1,920 diesel mechanics, with the average wage being $52,490 annually. Employment growth in the diesel mechanic industry is also promising, with the growth rate expected to increase faster than normal over the next few years. Economists predict this growth to add an additional 21,600 positions at mechanic companies across the United States. Local Garages: As the popularity of diesel-powered vehicles becomes more mainstream over the next few years, local garages will need to hire additional diesel mechanics to service this growing sector of performance vehicles. Charter Bus Industry: With more seniors reaching retirement age every month, the charter bus industry will experience a strong uptick in business. As more miles are logged on charter buses across the country, diesel mechanics can find employment opportunities with maintaining and servicing these fleets. Shipping and Transportation: As consumer spending increases, the number of retail products sold also increases. This growth requires additional diesel trucks to transport the goods from manufacturer to retailer, requiring the expertise of certified diesel mechanics to repair and service the growing number of diesel shipping vehicles. Businesses throughout Connecticut are starting to feel the need for certified diesel mechanics to keep shipping fleets and transportation services running at optimal performance levels. Most companies want to hire applicants who have taken the time to earn a degree in diesel technology as well as the applicable licenses. Individuals who are seeking to become certified diesel mechanics should earn their degree in diesel technology to increase their chances of success and job stability in today’s economy.